2008 may have been a bad year for just about everything else, but it was a great year for cookbooks. Honestly, I can’t remember the last time this many gorgeous, fascinating and downright inspiring books hit the shelves in one year. A couple of people I know have suggested that the worse the economy gets, the better the cookbook market will fare, since more people will turn to cooking both out of necessity and as a substitute for more expensive pleasures. I don’t know how true that is (particularly since I know other people who are convinced of the opposite), but I’d like to believe it; in fact I’d like to think that no matter what happens we’ll never have a shortage of beautiful books to inform and inspire us, to help us get dinner on the table, and to provide us a window into countries and cultures we can only dream about visiting. I’d been eagerly awaiting the release of this book, the third in the Asian trilogy by husband-and-wife team Jeffrey Alford and Naomi Duguid, since I first caught wind of it two years ago. The wait was worth it: it is stunning, every bit as beautiful and fascinating as their previous two (which already feature on my ‘top books of all time’ list). Like all their books, Beyond the Great Wall is as much a cultural exploration as a cookbook, in this case giving us insight into the people living physically and metaphorically ‘beyond the great wall’ of China – including the Tibetans, Mongolians, Uighurs, Miao, Kui, Dong and Dai – and as per usual with these authors, is illustrated with their own gorgeous location photographs (as well as breathtaking studio photos by Richard Jung). Food, of course, is the fabric that binds this journey together, and the recipes alone would be worth the cost of the book – things like Grasslands Herb Salsa, Silk Road Chickpea-Carrot Fritters, Kazakh Noodles with Goat Broth – but just as interesting and valuable are the sections on language, culture and history, as well as the authors’ own travel stories, which span a time period of nearly thirty years. And somewhat surprisingly for a cookbook, Alford and Duguid don’t make any attempt to shy away from politically sensitive issues, freely giving their own views on the plight of minorities in China, which has predictably attracted some criticism. Whether you agree with their views or not, however, this is most definitely a book to savor. I honestly didn’t think Australians Greg and Lucy Malouf would be able to top their previous (and widely celebrated) book Saha, a luscious homage to the cuisines of Syria and Lebanon, but somehow they pulled it off. Turquoise – much in the vein of Beyond the Great Wall – is a knockout of a book exploring the culture and cuisine of Turkey, as seen through the eyes of chef Greg and writer Lucy as they travel through the country for the first time. Lucy’s wonderful stories and essays open each chapter, setting the stage for Greg’s recipes – some carefully authentic, others more imaginative – and the whole thing is brought to vivid, full-color life with an abundance of gorgeous photos. Honestly, this book seems to have people bewitched; while I was browsing it at a local bookstore a few weeks ago, a girl walked by me, noticed what I was reading, and exclaimed, “isn’t that just the most beautiful book you’ve ever seen?” Some books feel like no matter how much you pay for them they’re still worth more, and this is one of those. What can I possibly say about this book that you haven’t already read a dozen other places? I don’t know, but I know I can’t leave it off my list. Chef David Tanis has put together a true gem with this book: imaginative, seasonal recipes that effortlessly straddle the line between sophistication and simplicity, a strong personal voice to put them in context, and a collection of photographs so lovely I’ve been tempted more than once to rip some out and stick them on the wall. The soul of David’s recipes is firmly rooted in his Chez Panisse background, though his influences are all over the map: Thai, Vietnamese, Mexican, Catalan, Moroccan, French… Ultimately, though, this is a book about letting the food speak for itself and trusting your own instincts, something we can all use a reminder about from time to time. One of my biggest regrets about leaving the UK is that I never found the chance to visit Ottolenghi before I did, but now that I have their cookbook I guess I can postpone that return trip a little bit longer. Ottolenghi is a small chain of London delicatessens run by Israeli expats Ottolenghi and Tamimi, who have won a devoted following for their generous, rustic, explosively-flavored food. Hailing from the Mediterranean as they do, their recipes are of course heavily influenced by it; things like garlic, lemon, pomegranate and za’atar are used with abandon, and fresh herbs, dried fruits and grains show up in all kinds of guises. They’re far from purists, though, and when all is said and done, whatever tastes best is what makes it into their dishes. Whatever your style of cooking, you’ll find some great inspiration here. Note: There hasn’t been an American version of the book issued yet, so what you’ll get from both amazon.com and amazon.co.uk is the same edition – if you’re looking to get a copy relatively quickly I’d recommend ordering from the latter. Let me just start by saying that if I had to choose just one Mexican cookbook to have in my collection, this would probably be it. A re-issue of Diana Kennedy’s 1989 classic, this has just about everything you could ever want to know about Mexican food inside, from dozens of variations on moles, enchiladas and salsas to things less familiar like moronga (blood sausage), vitualla (beef, rice and fruit stew), and minguichi (cheese fried with chiles and cream), everything accompanied by in-depth cultural and geographical explanations. Kennedy is famously abhorrent of shortcuts in Mexican cooking, and some might find many of her recipes on the labor-intensive side, but if what matters to you most is comprehensiveness and authenticity, I doubt you’ll find a better compendium of south-of-the-border recipes anywhere. The only gripe I have with the re-issue is that they still didn’t include any photos, but hey, that just leaves more room for recipes. Are you an improvisational cook? Do you ever stand in front of a fridge full of ingredients and wonder how on earth you might assemble the contents into something edible? Do you dream at night about titillating new flavor combinations? Do you want to better understand the mechanisms of taste and learn how great chefs construct their dishes? If any of these apply to you, you’ll want to have this book on your shelf tomorrow. This is a self-described ‘new breed of cookbook’, one that delivers not recipes, but inspiration. I would call it more of an encyclopedia of taste, cataloging just about every ingredient under the sun and cross-referencing it with other complimentary ingredients, cuisines and cooking characteristics. You’ll learn that fennel pollen is a ‘quiet’ flavor, should be used only to finish a dish, and is complemented by things like fish, lemon and pistachios. You’ll learn that Chilean cuisine typically includes the flavors of corn, cumin, garlic, oregano and raisins. You’ll learn the different flavors and uses of piquillo, guindilla, ñora and choricero peppers in Spain. You’ll even learn how to compose an entire menu around flavor affinities. I’ve only begun to scratch the surface of what this book offers, but already I can tell that it’s one of the most useful books I’ve run across in a long time. I was pleased to see that Epicurious gave honorable mention status to this book in their own top books lineup. Published right here in Seattle by Sasquatch, this is a wonderful compendium of favorite recipes from a truly notable group of cooks, namely members of Les Dames d’Escoffier, the country’s premier culinary association for women. Among the dozens of chefs, farmers, winemakers, restaurateurs and instructors represented in this volume are many familiar names – Julia Child, Alice Waters, M.F.K. Fisher, Marcella Hazan, Alice Medrich, Dorie Greenspan – and their contributions run the gamut from simple to spectacular while criss-crossing the globe several times: Piedmontese Wedding Soup, Catalan Pasta with Garlic Sauce, Texas Chile Rellenos, Jumbo Shrimp with Armenian Pesto, Tuxedo Philly Cheese Steak… Is your mouth watering yet? Mine sure is. I know, I know, this isn’t one book, nor is it anything new – in fact, the Culinaria series has been around for years. This year, however, the publisher has finally done exactly what I’ve been waiting for: they’ve started releasing the series in small paperback format. Yes, rub your eyes and read that again. Small and paperback. Okay, small is relative; these are now the size of most ‘normal’ hardback cookbooks, but if you’re familiar with the size and heft of the originals, you know what a difference this is. The content, luckily, hasn’t been altered one bit. Each of these books still contains some of the most in-depth explorations of national food landscapes ever published – from dishes both classic and obscure to regional products to festivals and celebrations, their breadth is encyclopedic and their information accurate. If there’s any drawback to these books it’s that there’s just too much information to digest – rather than sit down and read one all the way through you’ll probably end up dipping in from time to time to learn about, say, chorizo-making in Spain or olive harvesting in Greece. And I must admit I’ve never been terribly tempted by the recipes, but in these books they seem kind of like an afterthought anyway. So far, the ones to be released in this new format are Spain, France, Italy, Greece, Germany, Hungary, Russia and Southeast Asia. Hopefully the rest will be coming soon! What a great list! I’m eager to check out Les Dames and excited to hear about the Culinaria re-releases. And I’m glad to see something other than Alinea being plugged. If I had a bookstore nearby I would go and check out all of these. My visit to New Orleans in February will find me spending many hours in bookstores.I’m dying to get my hands on a copy of A Platter of Figs and Turquoise looks amazing.I found the giant, hardcover version of Culinaria’s France last year and love it. There are a couple of others from the series that I would love to own and it would be much easier (and lighter!) to bring them back from the States if they’re offered in smaller, paperback versions.A great list! Great list! I’m a recovering cookbook addict.Speaking of cookbooks, on 12/11/08 the Washington Post ran an article comparing software programs to create your own personal cookbook. Link is: http://www.washingtonpost.com/wp-dyn/content/article/2008/12/09/AR2008120900646.html. Nice list – looking forward to getting my hands on The Flavour Bible! I think I read somewhere in your website that you were vegetarian for a while? Was that right?If so, what would be your favorite vegetarian cookbooks? I didn’t see any in your bookshelf list.Thanks for the beautiful and informative blog. I’ve tried some of the vegetarian recipes you posted and they always come out beautifully.Catalan Chickpeas is my favorite so far. mbjb – Yes I was, from the ages of 12-21. Most of my cookbooks have been acquired since then, however, which is why I don’t have many specifically vegetarian ones. Of the ones I do have (or have used), I would have to say that Deborah Madison’s Vegetarian Cooking for Everyone and The Greens Cookbook are my favorites. I also *love* Kitty Morse’s North Africa: The Vegetarian Table. Apart from those, I find that Mediterranean-genre books (even if they’re not wholly vegetarian) tend to be wonderful for inventive vegetable, grain and legume dishes. Do you have any favorites to share? mbjb-I’m not a vegetarian but I do eat about 80% vegetarian. I think that Marcus Warings "One perfect ingredient" and Jamie Oliver’s "Jamie at Home: cook your way to the good life" are particularly good for numerous vegetarian recipes, even though they’re not wholy veggie books. Jamie’s book is all about growing your own so obviously he had to come up with good ways of cooking his home-grown produce! The right Indian cookbook would stand you in good stead too, as around two-third’s of the population is vegetarian-so have a look around that section of the bookshop? And the blog 101 Cookbooks, which is at the top of Melissa’s "Blogs around the world" list, is excellent for vegetarians if you haven’t yet seen that! Stellar list, thank you for the recommendations! Although I’ve sworn off my cookbook obsession, The Flavor Bible is now officially on my Amazon wish list! I love, love, love Alford and Duguid’s books (and I would love to be them!!!) – I’m so glad you included Beyond the Great Wall. Mangoes and Curry Leaves is also totally awesome, my husband has cooked so many yummy things from it. Do you know the Eating in Asia blog? Another husband and wife team who photograph and write in Asia. Not so many recipes (too bad!) but the photos are beautiful and the stories fun to read. Oh to be traveling and eating in Asia!!! I love this blog. I find myself printing off and bookmarking your recipes all the time, some even before I’ve read the recipe itself – terrible, I know. My Amazon wish list has many of the cookbooks listed here, but thank you for tuning me into the ones I hadn’t seen yet! Now if you’ll excuse me, I have to go find another bookshelf. I’ve fallen in love with your blog! I found it yesterday and cannot stop reading your posts. The atmosphere you create makes me happy – I feel like a child in front of a candy shop – everything is so amazing that you don’t know what you like the most. Happy New Year! Thanks Melissa and Sian for the great suggestions! i received the culinaria spain book for christmas from my husband and i haven’t been able to put it down. i have been reading it like a novel – cover to cover. besides a few spelling mistakes, it is an excellent and comprehensive book. i’m spain-obsessed and this book is making it worse that i"m in the US and not in Spain. Very good tips! 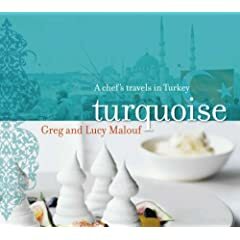 All books seems really great but as I am planning a trip to Turkey, I am really really interested about the cookbook Turquoise: A Chef’s Travels in Turkey by Greg and Lucy Malouf. Hope i will find some good tips what to eat in Turkey! Great list. As one of the founding members of the Les Dames d’Escoffier Hawaii Chapter, I was pleased to see LDEI’s book on the list. I love the Turquoise cookbook! It’s a heavy book but I lugged it all around Borders because they had only one copy left. I’ve made a couple recipes already and am loving just reading about their experiences and the true poetry of food. I love A Platter of Figs, and I love Ottolenghi. I don’t actually even know of anyone else who has it, but for me it was a great find. You didn’t mention Angela Hartnett’s Cucina which I think is wonderful too. You should check it out. Thanks for posting this list so I could discover the cookbook I’ve been searching for. The Flavor Bible is exactly what I’ve dreamed of, not being able to follow a recipe to save my life and a desire to play with spices leaves me with few other inspirational cook books. I bought The Flavor Bible because of this post and now I don’t know how I lived without it! !